Thank you. Very nice to have my little boast box back. ** NOTE: Some tribes have multiple Scouts, especially in PR. An error in the Exe Resource Tool has been corrected. Knot of Dementia in Jungle was listed as 150 area, bit in reality is a 200 area ... ya think I would know that as our OP is in the region and its only been like 10 years. The error was discovered by Lialotta and at first, I was thinkin, "how could it be in error for all these years and nobody noticed ?" ... plus given the name of the toom who reported it ... "Lie-a-lotta" .. shouldn't I hav ebeen suspicious ? :). Nice work on adding the Crafting Ranges, Freddy! It's really handy for all the crafters out there. There are only two small (and related) changes I'd like to see in future versions. 1) List doubled figures for either Damage or Speed parenthetically to reflect the use of Increased Damage or Hit Rate stanzas. 2) Modify the Dmg/Min field to accomodate the changes listed above. Or maybe list both the base and doubled values. It's basically the same Spreadsheet tool from 2 years ago (dunno if ya used) , only expanded to include Jools, Amps and Ranged. It took 12 years to get this far :) .... wonder if I'll live long enough to finish. Unfortunately, when the base damages were chnaged over the years, at least pre-merge, the data was in patch notes. Since you doing in head, do you have "the numbers" ? I never investigated what the numbers were or what part of the equation they might apply to. I never did figure out how the game does dodge / parry, but knowing the breakpoints and limits I made up my own work around formula based upon a trick I remembered from a structural design program that I wrote in 1973 (Fortran - punchcards) rounded beam depth to the nearest 1/2 inch (mainframe only could round up to nearest whole integer). Most of the formulae involve establishing the min and max values first based upon skill levels, and then applying boost and precraft % to the differences between them where its essentially Value = a + (b - a) x % x boost). How hard this would be will depend on whether the numbers from 1 - 3 are a logical progression and what parts of the formula they apply to. 2. I think think that part will be done automatically. My thinking inteface tho would be that there would be a checkbox for what we were adding (Inc Danmage for Melee / Hit Rate on Ranged) and a input box where ya put the level. This something I can take a shot at immediately for the SS version if ya like. As for the IG version, I think I have abused the generosity of our WebIG programmer and host for the time being. If you'd like to help with the numbers since it sounds like you have got a good head start already. I'll start right away fiddling with the SS. Will see if I can find where thes efactors are aplied in the game code but my skillz are weak here. 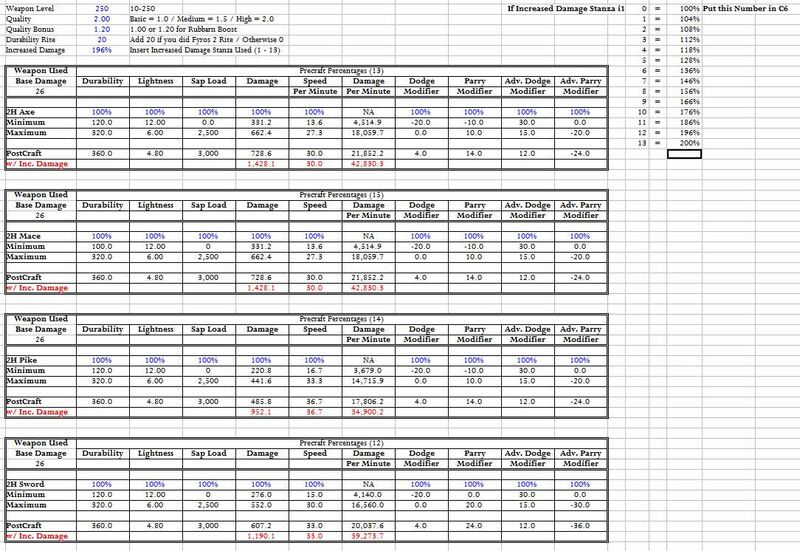 1) I hadn't considered the Bleed stanzas since many who use it wind up reducing the levels of Increased Damage and/or using a lower-than-maximum level of Bleed. Rather than account for that added variable, I felt is best to disregard it for a crafting calculator and keep it a simple "damage times speed". However, given the near-universal use of maximum levels of Increased Damage (or Hit Rate), I felt that doubling the DPM figures listed would be more representative of the most common use cases. 2) Most likely, but I've overlooked enough simple/obvious things that, whenever I see something that I know I myself might screw up (or have screwed up in the past), I just have to bring it up. I do like your idea on the interface. So in the spreadsheet, if ya typically use ID 12, then pop 1.96 into cell C6 and ya will get that answer. 1. Exe Resources Info Tool - Have been many requests for this tool to a) be expanded to include PR regions and b) to add Sup Weather Availability as well. After discussions in Guild as well as with other long time players, it was deemed that b) was not in the best interests of the game. As for a) if we can muster up enough help, gonna undertake the job. After doing Nexus solo, still feeling a bit burnt, so gathering a few contributors would help get this off ground. Have been converting all the spreadsheet formulae from this tool to text format, so that (hopefully) users will be able to cut / paste into the *.txt files Arc mentions in the initial posts. Just taking a quick glance there's about 40 different craft characteristics and about 30 different craft combos that produce different characteristics. So basically that's 1200 different "pulls" in the game code that the formulae act upon. Copy / pasting all that out of the spreadsheets plus precraft, base values, multipliers, constants, etc. is bound to create some inappropriate paste errors. If anyone wants to participate, indicate an interest in a craft skill tree you have mastered (LA, MA, HA, Bucklers / Shields / 2H Weaps / 1H Weaps / 2H ranged / 1H Ranged / Amps / Joolz. Idea is to insert the post-craft data into KC and see if the results are consistent. If anyone has an interest in contributing to either endeavor, please send an IG mail to FF and, if we can gather enough folks will get underway. Underspring or Abys of Ichor will be the 1st PR region we will "weather map" depending on the response. For the Crafting Tool, I have only converted LA, MA, HA, Bucklers, Shields, 1H Weaps and 2H Weaps to text format ... will get the others done as time allows. Oh, reminds me... I was going to ask, why 2h mace has minimum durability 100 and other weapons 120? Good catch ... that's one of those copy / paste errors:Durability = Game Code Data:C15+Game Code Data:C15*$C$3*$C$4*C24+$C$5You can see these from the tableGame Code Data:C15 = 100$C$3 = 2.00 for HQ$C$4 = 1.2 for Rubbarn BoosatC24 = 100% Precraft %$C$5 = +20 for having done the Durability RiteFor whatever reason, when I pasted down from Axe to Mace, instead of $C$5 it wound up with $D$5 which is text so it did not add the +20 ... now fixed, Thank You !